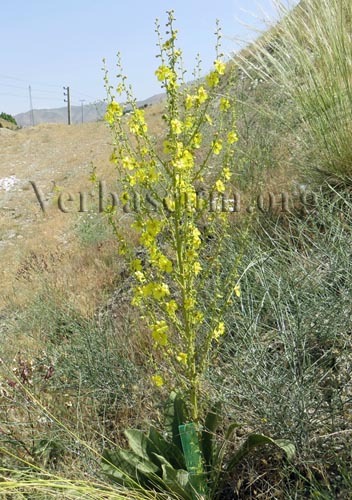 The genus Verbascum, (English: mullein or velvet plant; French: molènes; Persian: Khargooshak خرگوشگ or Gol-e-mahour گل ماهور ; Italian: Verbasco; Arabic: اذان الـــــدب، البوصير أو البوصفير; Kurdish: Masîjark), is a genus of about 360 species (and many hybrids) of flowering plants in the Figwort family (Scrophulariaceae). They are native to Europe and Asia, with the highest species diversity in the Mediterranean region. They are mostly biennial, the first year they grow a flat rosette of large velvety leaves, and in the second year a tall flower-spike will be appeared. 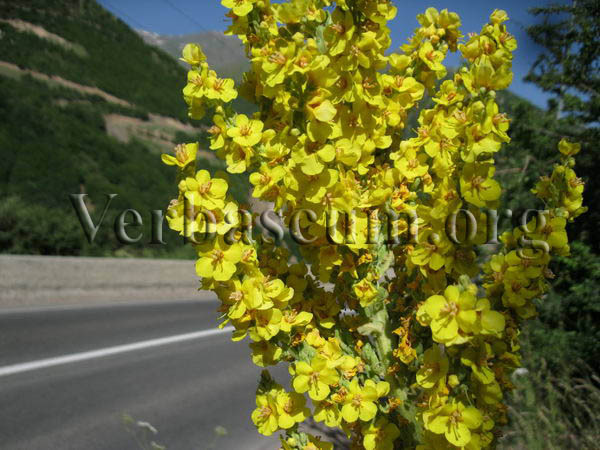 Verbascum has a long history in traditional or herbal medicine (On Ulcers By Hippocrates) and is used as a herbal remedy, and is an effective treatment for asthma and respiratory disorders (mullein tea). Tea of leaves or flowers contain mucilage which can smooth irritated membranes. Research has shown that Verbascum has strong anti-inflamatory activity and also its flower has antiviral properties. Verbascum flower oil has been used by the Cherokees for treating hemorroids. Mullein leaves and flowers extract also used as skin softener and for hair rinse, in Roman times. The harvest time for its flowers, leafs and sometimes roots is between March to August. The most famous one for medicinal use is Verbascum thapsus (great mullein or common mullein) Extracts of the plant’s flowers are very effective treatment for ear infections. In some countries, it is cultivated for its medicinal properties. Also, because of its attractive foliage and beautiful flowers, several mullein species like moth mullein (V. blattaria), with light pink to white flowers, Olympic (or Greek) mullein (V. olympicum), with golden yellow flowers, Purple mullein (V. phoeniceum) with long-blooming flowers, nettle-leaf mullein (V. chaixii) with purple-centered yellow or white long-blooming flowers and some hybrids mentioned as an ornamental plant in some countries. Although most are either biennials or perennials, they are remarkably known as low-maintenance plants with a long season of bloom if you keep just a few things in mind while planting them. They are well suited to the sandy or rocky soils with no serious disease or pest problems and has few maintenance needs. They can be propagated by seeds or root cuttings from late winter to early spring.